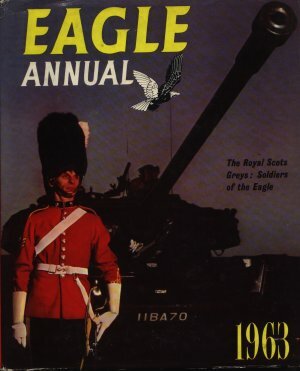 Eagle Annual 1963 also has a sub-title of Volume 12. Its inner front and back covers contain images of "This Age and its Wonders". It would not have been complete without its regular features which include Harris Tweed, Dan Dare and Waldorf & Cecil. The Dan Dare story is in colour, as are the pictures in the Fifty Fighting Years and Grand Prix articles. Dimensions : 21.5cm x 26cm with 176 pages.